1305117220 -Combining depth of theory with practical applications, Madura’s best-selling INTERNATIONAL FINANCIAL MANAGEMENT ABRIDGED, 12E builds on the fundamental principles of corporate finance to provide the timely information and contemporary insights needed to prosper in today’s global business environment. 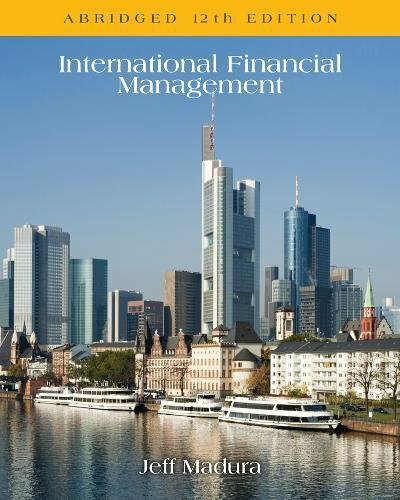 With its signature reader-friendly style and clear explanations, the text introduces international finance with a focus on the important role of modern multinational corporations in global commerce. It discusses a wide range of managerial topics using a strong corporate perspective. Emphasizing the most recent financial changes and industry trends, the Twelfth Edition highlights financial reform and its impact on international finance today. Self-tests, expanded real-world applications, and relevant examples provide the hands-on experience you need to prepare for contemporary practice.